Microsoft Applied Sciences researchers have created a concept 3D PC thats has been created to enable uses to manipulate applications within a 3D environment. The transparent screen on the new 3D PC concept makes it look like a visual trick. But as soon as you start interacting with your hands behind the screen, the illusion is shown in all its glory. Watch a video after the jump showing the concept in action, using bBehind the screen overlay interactions. The transparent 3D PC concept has been developed by researchers Jinha Lee and Cati Boulanger from Microsoft Applied Sciences, and shows a glimpse of what future computers and workstations may look like in a few years time. making it easier for the user to interact with the keyboard and screen simultaneously. 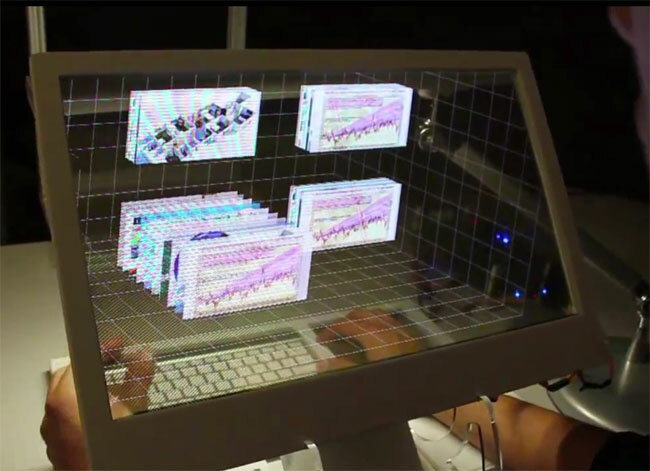 The 3D PC has been created by combining a Samsung transparent OLED and a Kinect motion controller camera. The system also incorporates heard tracking to adjust the 3D perspective of the screens visual effects.